Ocular Melanoma program at University of California, San Francisco (UCSF), uses protons to treat ocular or uveal melanomas, which occur in the iris, ciliary body or choroid regions of the eye. The UCSF Ocular Melanoma Proton Radiation Program is one of a very select group of programs across the nation and world, which has long-term experience in treating uveal melanomas. They have been using particle radiation therapy since 1978 and have treated more than one thousand patients with uveal melanoma. Proton or charged particle radiation, which is one type of radiation therapy, is very effective for treating uveal melanoma. 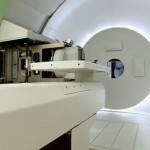 Because of the properties of proton therapy, there is minimal dose to the surrounding normal tissues, making it ideal for treating tumors of the eye. The treatment itself only takes about 2 minutes. The radiation is painless. The patient is positioned in an upright, chair position and uses the mask made for him to keep in place. 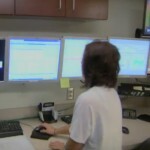 A small red light appears for the patient to focus on, keeping the eye from moving. This is performed usually once daily over 4 days. 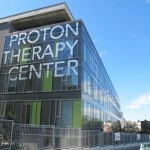 The proton treatment is planned to be performed over the course of one week. 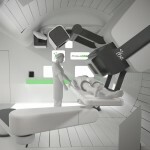 Ocular melanoma patients treated with proton therapy usually enjoy an excellent chance for tumor control.